If you're looking for style-on-the-go, adidas Originals has launched a unique application that provides first-of-its-kind access to the brand via the iPhone. If you're looking for style-on-the-go, adidas Originals has launched a unique application that provides first-of-its-kind access to the brand via the iPhone. The entry point into the mobile adidas Originals world is their special snapshot feature, which gives users a recommendation for a new pair of sneakers by taking a snapshot of another pair of shoes. Additionally, users can check out the nearest adidas store, browse the entire product catalogue and have access to the adidas Originals Facebook page. Though image recognition applications have already been launched, the adidas Originals App uses 3D image recognition for real-life objects and products, making it the first of its kind in the sneaker industry. Users take a photo of a sneaker, and the app responds with the closest, most relevant matches based on the color of the input image. Adidas hopes the app will give consumers the chance to find the best replacement for their old sneakers. As stated, users will also be able to scroll through the adidas Originals catalogue, spin the products around in a 360-degree view and stay informed about new product drops. In addition, users can pinpoint an adidas Originals store within 50 km of their location. A quick link to the adidas Originals Facebook page provides informative content, such as new products, events an contest on a daily basis. The new adidas Originals App is available for free starting today and will be first presented in public during the Lollapalooza 2011 Festival in Chicago, USA, from August 5th-7th, where festival visitors can download and try out the app. 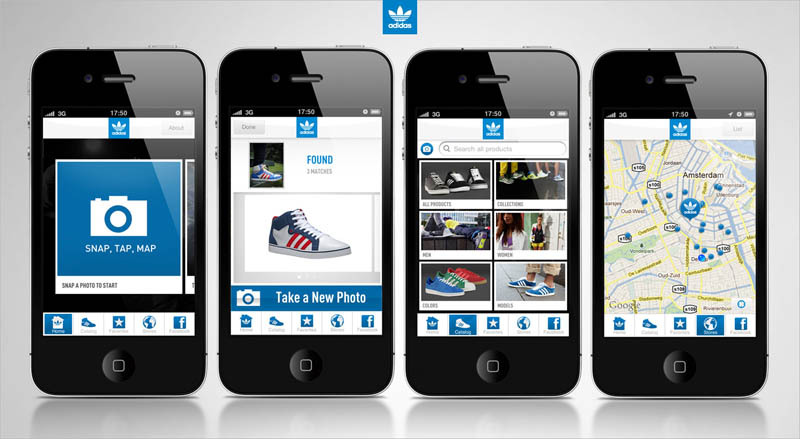 The adidas Originals App launches in USA, UK and Japan and a further roll-out is planned for other countries to follow.